Details about Sniper: Ghost Warrior (Sony PlayStation 3, 2011) Complete! 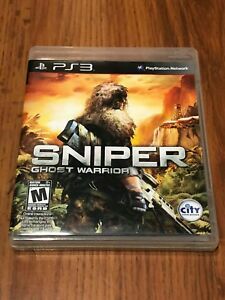 Sniper: Ghost Warrior (Sony PlayStation 3, 2011) Complete! Sniper: Ghost Warrior is a high-definition first-person shooter, with a modern military theme and realistic presentation. The game focuses exclusively on the role of a long-range sniper, in various battle situations. A sophisticated physics model accounts for ballistic factors such as falloff over long distances and the effects of wind speed and direction. Players also manage their shooter's positioning and breathing, to squeeze off the perfect shot at the right time. An up-close "bullet cam" allows gamers to follow their shot to its target. They work with a small squad of spotters and other snipers, in some scenarios. As the story goes, commandos in an elite squad have been sent to a South American island. This small country has been taken over by a military dictator. Missions have players supporting a rebel movement set on overthrowing the oppressive government and restoring democracy. Missions are set in thick, tropical, South American jungles. This exclusive offers the "One Shot One Kill" DLC, which allows gamers to shoot through any object, use pinpoint accuracy to inflict super damage on enemies, and experience steady shots in which the scope does not float. The package also includes a "Sniper Stories" book, a Ghost Warrior dog tag, a poster, and limited edition artwork postcards. Immediate payment of C $11.95 is required. Sniper: Ghost Warrior PS3 is here But it's brought new problems with it without fixing what made Sniper less than the sum of its parts last time around.somewhere in the journey from PC/360 to PS3, something has gone very wrong. Character models are awkward and bizarrely shiny, though the environments appear expansive and lush. However, this is punctuated by an abysmal framerate -- the game chugs along unless you're looking at the floor or directly at the sky. Almost as distracting is the egregious screen tearing that plagues Sniper: Ghost Warrior on PS3 -- at times it seems like the image on screen is breaking apart in three of four different places. The "improved graphics" are nowhere to be found and Sniper: Ghost Warrior PS3 is one of the uglier shooters of the last few years.The sniping mechanic itself has made the transition to the PS3 more or less intact, though. While Sniper: Ghost Warrior isn't quite as excruciatingly prone to realism as, say, ARMA 2 or the original Operation: Flashpoint, it seems realistic. Shots from the titular sniper rifles in Ghost Warrior are subject to gravity and environmental effects from wind and the like, such that play is predicated less on twitch gunplay and more on setting up and taking the right shots at targets. Sniper: Ghost Warrior makes itself more accessible than the more stringent military simulations by granting the equivalent of sniper super powers; clicking in the right stick while zoomed in with a sniper rifle causes the world to slow, simulating the increased concentration of an inwardly held breath from a trained marksman. On the default difficulty, this is accompanied by a red circular sub-reticule that will appear if you hold your aim long enough, which displays exactly where your bullet will land after the effects of wind and gravity. On harder difficulties, this sub-reticule vanishes, leaving you more at the whim of the elements. Firing a sniper rifle in Ghost Warrior feels distinctive and particularly rewarding in comparison to most titles' point-and-click approach to long-range combat.The graphical issues -- as well as some generally poor voicework and text riddled with grammatical errors -- pale in comparison to level design that does little to support actual sniping, and which is often dependent on AI triggers tied to waypoints that aren't especially well implemented. Enemies will spawn into levels based on these triggers in bizarre ways that test suspension of disbelief, and make it difficult to effectively plan out an approach.The run-and-gun sections from last year's 360 and PC releases of Sniper: Ghost Warrior have been removed more or less, replaced by cutscenes that show the results of the assault missions in question. While these sections were generic, not-fun messes, their removal is somewhat of a wash, leaving Sniper: Ghost Warrior on PS3 a game that suffers even more from a feeling of sameness. Some new, actual gameplay addition would have been welcome. Instead, there are more sniper levels, set aside from the main game and available for immediate play. But the only really new conceit -- to take away the HUD and checkpoints -- don't make for more fun. They make for even more frustration. These sections serve only to demonstrate how poor the AI and basic shooting in Sniper: Ghost Warrior are -- when the AI isn't spotting you with machine-like precision in brush from 2000 yards away, that is. Good shooting game BUT, very different from others like COD. For those who like moving slowly inside the jungle, avoiding the opponent just like a sniper, this is a good game. Don't expect those insane movements/interactions from games like Call of Duty. This is a first person shooter of a different kind. The game has some glitches that does not really bother, like freezing the screen while saving. I would say that the secret is "be pacient and you'll be there" Looking forward for the Ghost Sniper 2 in early 2012. Would have been much better if shooter could carry additional shoulder weapons. Trying to shoot a sniper rifle in close order combat was very frustrating and I found myself losing interest. Amazing Game, I have been waiting for a game like this to come out for a very long time. This game is about as realistic as you can get out of video game, graphics are amazing, wind actually throws off your bullet! I recommend this game to anyone who likes to play as a sniper in games like Call of Duty. Controls are very similar to COD. Lots of action, hard to put down the controller! There are actually multiple story lines in this game, one continues off the other, so when you think your done, you have more sniping to go. Very very good game, you will not be disappointed.